Welcome back to our countdown of the Top 10 Customer Complaints of 2012 for Restaurants! If you are just joining us, get caught up on our countdown and check out #10, #9, #8, #7. Waiting too long to be seated. This type of wait-complaint affects restaurants differently depending on whether reservations are accepted or not. First, restaurants that don’t take reservations already have a plethora of issues dealing with hungry cramped customers waiting to be seated. However, these folks typically get it – they know there is a wait and they choose to stay anyways. 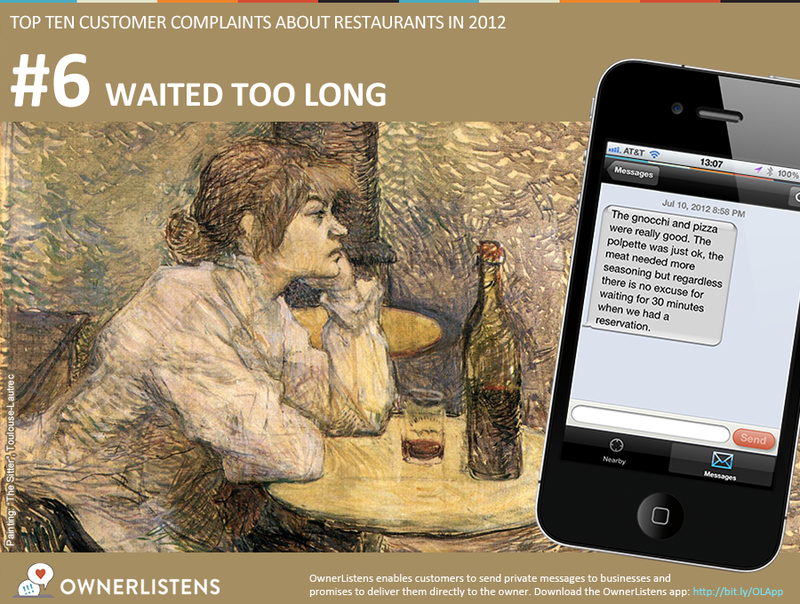 However after analyzing the 2012 complaints, we have learned that, sometimes, restaurants can break down this expectation. By request of a customer, a restaurant employee may provide an estimate of wait time in effort to please the customer. Unfortunately what may go unnoticed is that after receiving an inaccurate estimate, the customer’s expectation has shifted and the restaurant is now perfectly set up to disappoint. More specifically, a customer that was originally were willing to wait 30 minutes, but was told the wait would be 15 minutes, is now ultimately disappointed when the wait takes 20 minutes. While this clearly sounds like a frustrating scenario, the worst type of waiting too long to be seated is when the party actually has a reservation and this firm time commitment is not honored. By examining the 2012 feedback, we have found that a ten minutes grace is commonly acceptable with reservations, especially on crowded nights. However any longer, and the customer starts feeling that their time is not respected. Perhaps the customer is paying a babysitter at home, or perhaps the customer has a flight to catch. In the end, this is simply annoying. Some restaurants may feel that a brief wait to be seated portrays your restaurant as doing well; we recommend taking caution with this and to never be complacent. It generally isn’t worth customers giving up on you in the first place because they dread the long wait. Waiting too long for food. It’s subjective but generally speaking, people expect their food fast. There are different tolerance levels for wait times but our research shows that after about 20 minutes, customers start to think they’ve been forgotten. While drinks, bread service, or quick appetizers can extend that time longer, it’s essential to ensure your customers don’t find themselves waiting too long for the items they ordered. Waiting too long for the check. Surprisingly more than waiting for food, this wait-complaint seems to aggravate customers the most. To understand this, image how customers feels in these moments: they are finished enjoying their ordered items, are winding down conversation at the table, and may even need to leave for an external reason. However, despite being ready to go, they cannot because no waiter is in sight to bring or take their check. More than wait-complaints involving seating time and even food, this wait-complaint is so powerful that an otherwise flawless and amazing experience can be completely tainted by an excessive wait for the check. Examining feedback in more detail, it appears that at this point of the meal, as short as a 5 minute wait can feel like forever indicating that customer patience is very low. First, be clear about wait time wherever possible. Whether it’s for a table or for the food. You should have a general level of understanding for how long things will take. Remember there is some available flex time, but if something is going to be an egregious wait, it’s best to say so as soon as possible. If you don’t have a good sense of the timing, simply do some measurements to figure this out. Have one of your kids, your spouse, or friend watch and time the place over a period of a couple representative dates and analyze the data to better understand your flow. Do certain dishes take longer? Are certain waiters faster then others? The more clarity you give customers, the less disappointment looms. Second, if you miss the mark by a mile, address the situation directly and apologize where appropriate. It’s easy to do something nice for the customer or for the table. It doesn’t need to be huge, but it does need to be an acknowledgement of appreciation for the wait. Upon examination of 2012 feedback, owners that do this well are most successful addressing wait-complaints and ultimately turning a negative situation into a positive one. Third, if wait-complaint issues are recurring in your business, take a closer look at your bottlenecks so you can find a long term fix. Gathering data is immensely helpful for this (your POS also might already have some helpful data). For example, you may find that while food is prepared swiftly it is not delivered immediately to customers because servers are overwhelmed. An extra server in peak hours would alleviate this. In the end remember that for a successful restaurant, wait times are bad for business in two ways. Not only do they detract from customer experience, they also decrease table turnover time and high table turnover means higher revenues. Oftentimes, it may be challenging to identify when these wait-complaints occur. This leaves you without helpful information or any opportunity to address complaints. OwnerListens is a perfect solution for this so signup now if you haven’t already. Owners, have advice or strategy for how to mitigate wait-complaints? Tell us here in the comments section. Consumers, help your local businesses out by telling the owner when you experience a wait-complaint issue with the OwnerListens app.